It’s Monday night. The weekend just past was a busy one. I spent all of Saturday out at Beaudesert for work, getting home in time for dinner, showers, storytime with the kids, then bed. Sunday flew past as Sundays are wont to do and suddenly it was the start of a new week. It was grey and drizzly all day, fine almost-rain that shrouded the city in mist. The streets were quiet. I dropped W at daycare and met a friend for coffee. I bought a book and read while T slept. And now, it’s Monday night. Both kids are sleeping and I’m sitting curled up in a corner of the couch with my big slouchy woolen jumper on. There is a rhubarb-orange crumble in the oven (and some vanilla bean ice cream in the freezer), all ready for the eating. 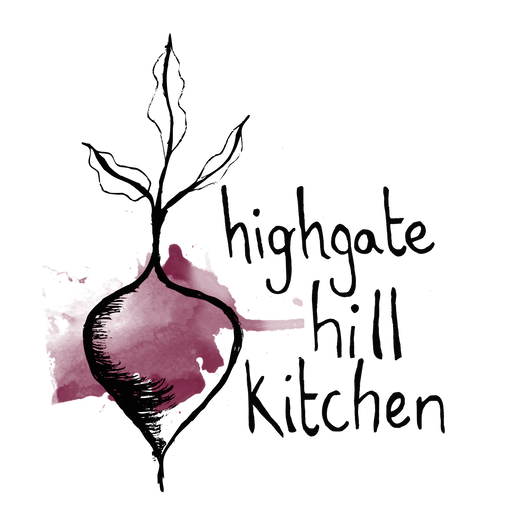 The sound of the rain is complimenting the scent of oven-browned crumble. I’ve started watching Orange is The New Black. Tonight my big plans include getting into bed, watching an episode, and eating crumble. Amidst the grey and drizzle I felt like eating a satisfying hot lunch for minimal effort. And so I brought out an old favourite. 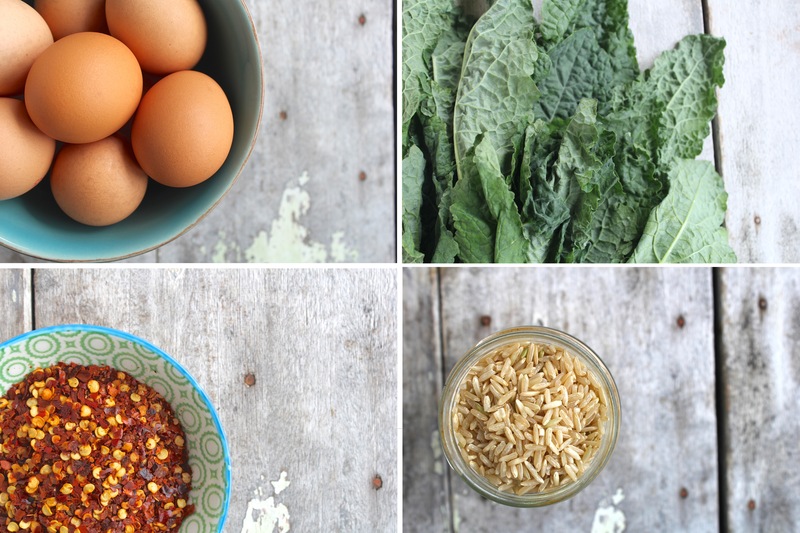 Brown rice, for nutty goodness. 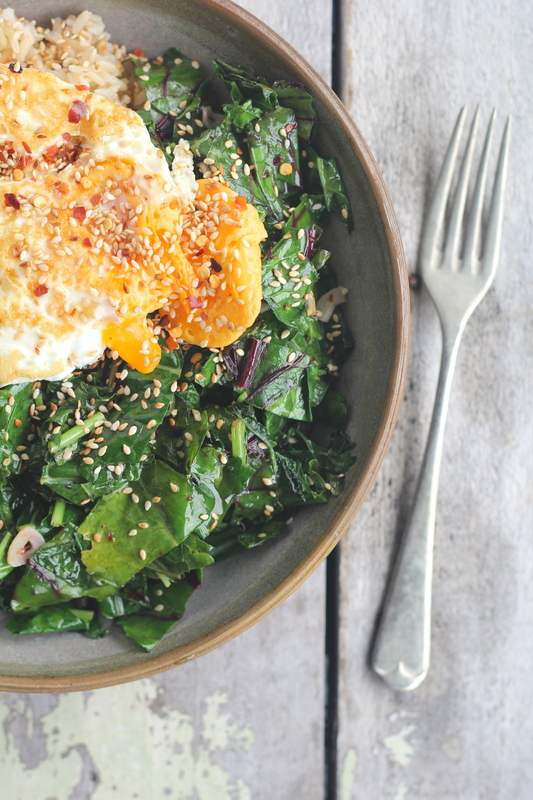 A mess of deep leafy greens, pan-fried and slicked in sesame oil. Fresh garlic and red chilli, for flavour. And a fried egg, just ‘coz. This meal is simple. Satisfying, and simple. You can use whatever greens you have on hand – this time around I used a mixture of Tuscan kale, beetroot leaves, and warrigal greens, ‘coz that is what I had in the fridge. It is, in fact, a great way to use up any greens that are on their last legs. 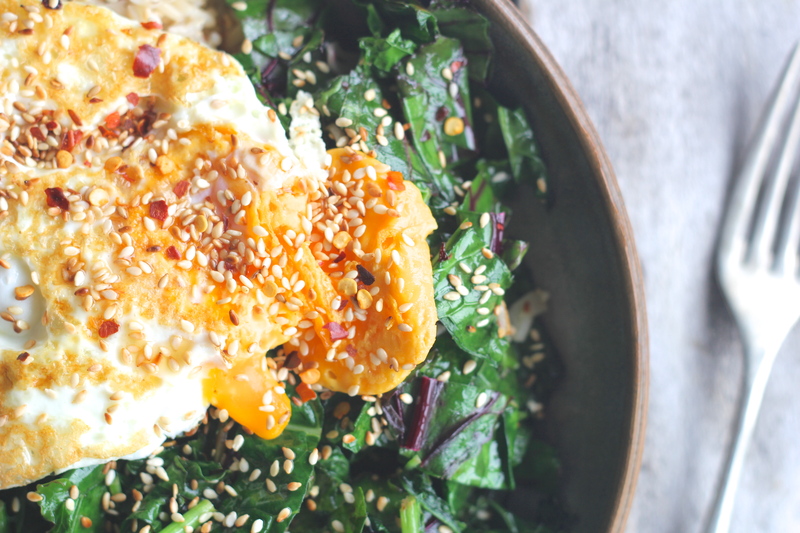 That said, because the flavours in this meal are quite straightforward the quality of your ingredients will make all the difference – use fresh free-range eggs, organic greens, and definitely definitely good garlic. You’ve probably got your own version of this kind of rainy day can-do-no-wrong meal. 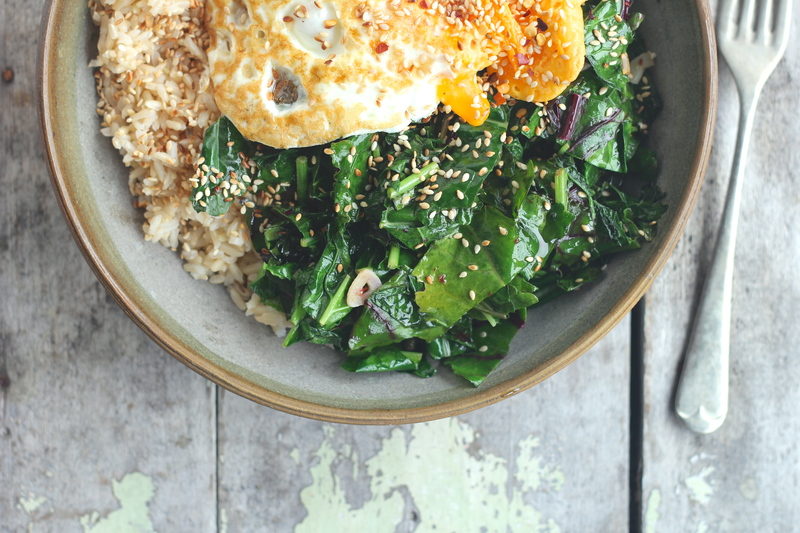 This Pan-Fried Greens with Brown Rice & Eggs is mine. And it hits the spot, every time. Cook brown rice according to instructions on the packet. Finely slice the garlic cloves and fresh red chilli (if using). Chop/tear the greens into strips. 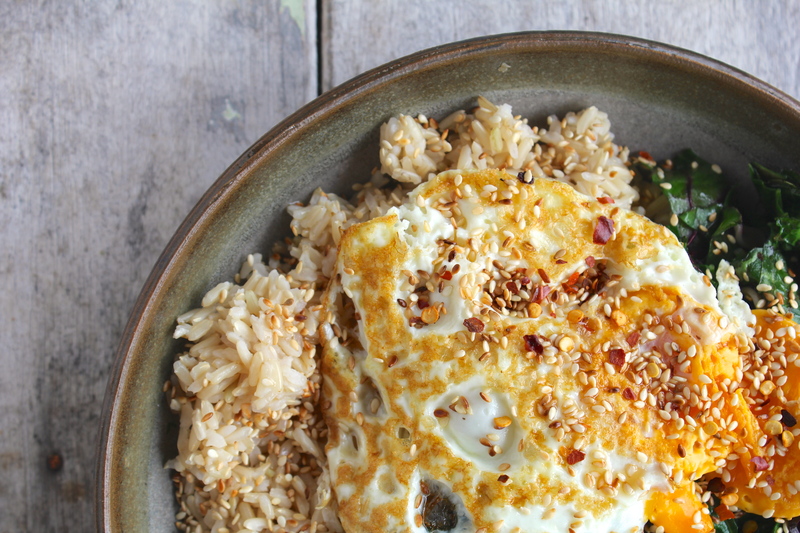 When the rice is almost ready, heat a splash of olive oil in a pan over a medium-high heat. Add the sliced garlic and the fresh or dried chilli and cook for about 30 seconds. Add the greens, a generous splash of sesame oil, and continue to cook, stirring frequently, until they are wilted and cooked through, 3 – 5 minutes (depending on what type of greens you are using). Transfer from pan to bowl, and set aside. Add a splash more olive oil to the pan used for cooking the greens and crack your egg directly into it, over a medium heat. Fry on one side for 3 – 4 minutes, or until the egg whiles are just set, then flip and fry for another 1 – 2 minutes. Transfer your cooked rice to a bowl and drizzle with sesame oil. 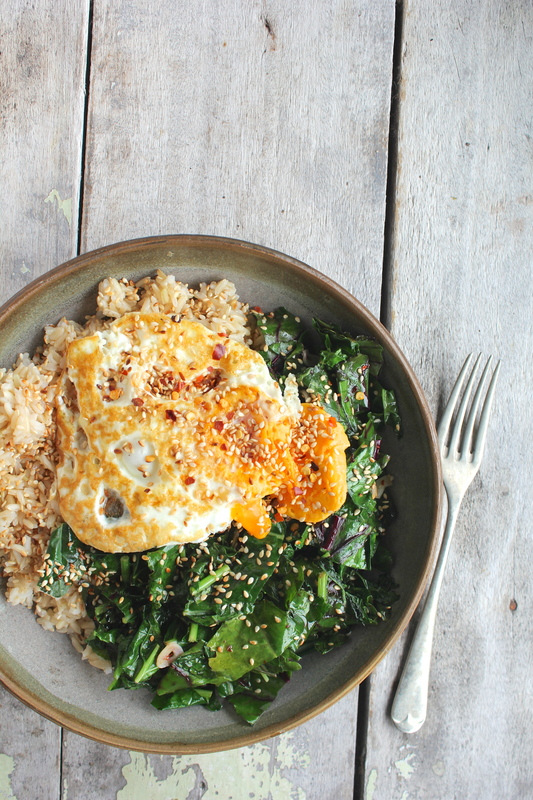 Top with the greens and fried egg, and sprinkle with the toasted sesame seeds (if using).